Best Brunch Cocktail Offering goes to Calle Ocho, located inside The Excelsior Hotel. Its infamous unlimited sangria bar makes Calle Ocho's brunch special (i.e., each brunch main course includes "unlimited" access to the sangria bar consisting of about 6-7 varieties of sangria, so long as you abide by "The Rules" stipulated on the menu) the best deal in town for a "smashing" brunch! Expect to be tipsy, if not happily drunk, by the time brunch is over as the afternoon rolls around. Also, the restaurant's Latin American-driven brunch cuisine is a nice change of pace, to the traditional American brunch offerings (waffles, eggs, omelets, pancakes, French toast, etc. ), with an eclectic flair of flavor. Like the vaca frita, which is a Latin American take on the usual American "steak and eggs" -- Cuban skirt steak with Latin fried rice, tomato escabeche, avocado, and fried eggs. Amazingly delicious! Be sure to reserve a primetime brunching reservation (I believe the restaurant takes reservations several weeks out). Or else you will be dining at an odd hour, if at all. Best Pancakes (and Best Accompanying Side Order) undoubtedly goes to Clinton Street Baking Co.
Its classic pancakes (with wild Maine blueberries and a side of warm maple butter) and opting for a side of sugar-cured bacon (there should be no objecting here) makes for a satisfyingly sweet-and-savory brunch that just hits the spot of a classic American brunch dish. So either get here early, close to when it opens (or during "off-hours"), or risk waiting for what will feel like eternity for tables in this intimately seated joint to open up (on a weekend, be wary that a two-hour wait is not uncommon) as they do not formally take reservations. Best English Breakfast & High Tea Shebang goes to Tea & Sympathy. The Full-Monty Breakfast with beans (always opt for them -- I promise they will change your life if you haven't already had them) encompasses the epitome of a classic English breakfast. The breakfast consists of scrambled egg with English bacon, a banger (i.e., a sausage), and grilled tomato and includes a glass of fresh orange juice, choice of coffee or a pot of tea as well as choice of white or 7-grain toast. All for under $20! In addition to this wonderfully complete breakfast, the traditional scones are just divine, served with clotted cream and strawberry jam. Almost like dinner biscuits, the scones are dense, buttery, and soft in texture. Spread with the clotted cream and topped with strawberry jam is a heavenly bonus -- creamy, tart yet sweet -- balancing out the richness of the scone. These are the two dishes that you must order for the table (at least one of each so that everyone in your party can sample it). Particularly, the breakfast beans will change the most hesitant of minds (i.e., those that dislike beans normally) into true believers that when prepared well, they are in fact pretty good! Also like Clinton Street Baking Co., expect crowds to congregate outside whilst waiting for a seat in this 6-8 table spot. 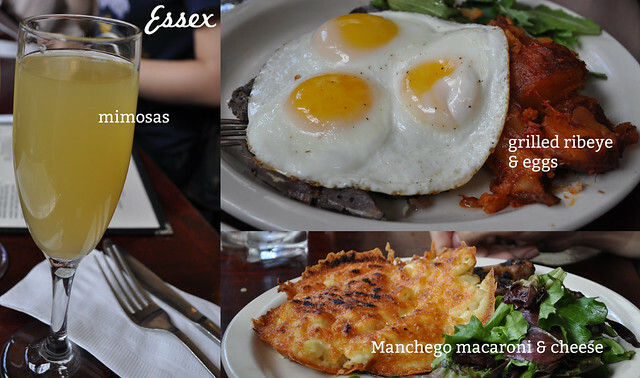 Best Traditional-eqsue Brunch goes to Essex. The brunch prix fixe special at $22.95 includes choice of brunch main course and three glasses of brunch cocktails (mimosa, bloody mary, and/or screwdriver). However, you may get lucky with your service that day, they may refill your flutes/cocktail glasses more than three times during the course of your meal. So brace yourself! As for brunch main courses, a surprising favorite is the Manchego macaroni & cheese, a fried delight! For $2 extra, the grilled ribeye and eggs is a great brunch waiting to happen, too, especially if you like a manly start to your Sunday brunch! Very tender meat -- not at all chewy or overcooked. Last but not least, Fanciest Innovative Brunch Menu goes to Norma's of Le Parker Meridien Hotel. The menu has some fun offerings, but the foie gras french toast, the savoriest of the savory, will certainly be one of the biggest pampering jobs you can do for your stomach during a weekend brunch. Plus, each patron gets a complimentary smoothie (even if it is shot glass-sized) before selecting a main course.Norma's also happens to be the place that offers a "secret omelette" (a name which I dubbed because it doesn't appear on the printed menu) which has a going rate of $1,000, comprising of eggs, lobster, and approximately $995 worth of caviar. So no matter what you go with, a food coma immediately following this meal is not unexpected.